Hundreds of Florida Farm Bureau members from across the state convened at the state Capitol to meet with legislators during Florida Farm Bureau’s annual Legislative Days in Tallahassee, March 7-8. The state’s largest general agricultural organization kicked off the 2017 legislative session with a major legislative event to give members the opportunity to meet with state lawmakers and discuss key policy issues that affect agriculture. Priority topics included the controversial bill SB10, a land buying proposal that calls to remove 60,000 acres of productive farmland to build a reservoir for water storage south of Lake Okeechobee. Other issues included pollution notification requirements,tax policy, an agricultural legislative package and UF/IFAS budget requests. 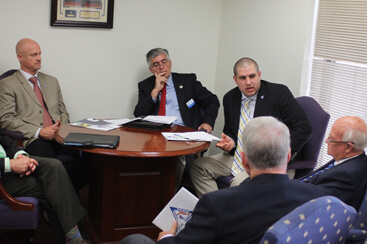 The two-day event kicked off with a reception at the Florida Farm Bureau office in Tallahassee where members mingled with legislators and government officials. A briefing breakfast followed on March 8 at the Hotel Doubletree where legislators briefed members on important issues facing the state this year during legislative session. A networking “Taste of Florida Agriculture” public reception at the Capitol Courtyard concluded the event where more than 2,000 guests attended. Visitors were able to sample locally grown Florida commodities, meet family farmers and learn about the importance of an economic sector that provides nearly two million jobs and contributes $120 billion in revenue to the state. Guest speakers at the reception included Florida Commissioner of Agriculture Adam Putnam and Florida Farm Bureau President John Hoblick.